To prevent potential damage and ensure an optimum cycle life, industrial batteries always need to be safely stored. VRLA (Valve Regulated Lead Acid) batteries, sometimes referred to as SLA (Sealed Lead Acid) batteries, are known to be relatively easy to store and handle. Because the electrolyte in the battery is immobilised in either Gel or AGM (Absorbent Glass Matting), VRLA batteries are considered to be ‘dry’ or ‘sealed’ and can be handled and shipped accordingly as non-dangerous goods. Despite this, safe storage should always be a priority. Damage to the plastic casing of a battery can result in electrolyte leakage. Additionally, storage in temperatures that are too cold or too hold will significantly impact on battery performance. Short term storage advice for VRLA batteries differs slightly between manufacturers and VRLA battery technologies. It is important to check the self-discharge rate of the battery and the suggested storage time of a battery. Batteries that are left for periods of time will over discharge from their self-discharge rate and potentially damage the battery. 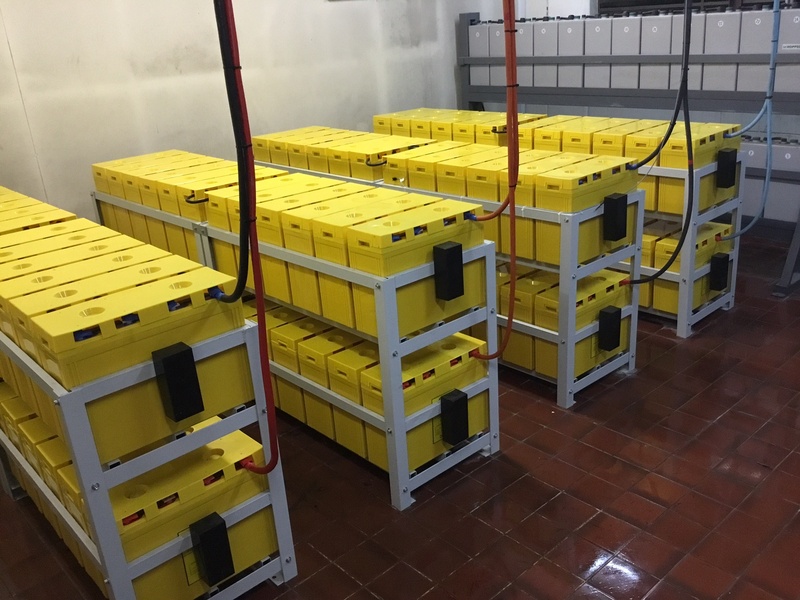 In this blog, the industrial battery experts at Valen take a look at some important advice for storing both AGM and Gel VRLA batteries. Do not store batteries outside, exposed to the elements. Store indoors in a cool, dry location. Do not store batteries in temperatures over 30ºC. The recommended storage temperature for VRLA batteries is 20ºC to 25°C. Do not stack pallets or allow any other material to be stored on top of the pallets or batteries could be damaged. Do not store where the possibility of metallic objects falling on the battery may occur. Ensure terminals are covered to prevent short circuiting. Do not store batteries directly on a concrete floor. Store batteries on a thermal insulation material such as pine flooring board or similar. When removing batteries from storage use the oldest ones first. This could save you recharging. After removing your battery from storage, it is always recommended to recharge before installing into a system. Recharge batteries on a regular basis as suggested by the battery manufacturer. Storage of any type of VRLA battery beyond the recommended storage time, without charging, can result in loss of capacity, cell shorting and loss of float life. It can also void the battery's warranty. If a VRLA battery is going to be stored for several months in higher than average temperatures, a refresher charge may be required. A refresher charge is an equalization charge applied to a battery that is stored in open circuit (not float charging) condition. As mentioned earlier in this article, short term storage guidelines for AGM and Gel type VRLA batteries differ slightly in relation to recommended storage times in certain temperatures. Careful records of battery storage time and handling will help to ensure optimum performance. If AGM type batteries are to be stored for 6 months or less at 20ºC, before being put into service, nothing needs be done at this time. If the batteries are to be stored for longer than 6 months, at temperatures greater than 20ºC, or installation is delayed beyond expected time, a refresher charge may be required. If the storage temperature is 20ºC or less, AGM type batteries must be charged at least every 6 months while in storage. For every 8ºC increase above 20ºC, the storage time between charges is cut in half. Therefore, at 28ºC the maximum storage time is 3 months. At 25ºC, the maximum storage time would be 4 to 5 months. If Gel type batteries are to be stored for 9 months at 20ºC to 25°C, before being put into service, nothing needs be done at this time. If the batteries are to be stored for longer than 9 months, at temperatures greater than 20ºC, or installation is delayed beyond expected time, a storage charge may be required. If the storage temperature is 20ºC or less, Gel type batteries must be charged at least every 9 months while in storage. For every 8ºC increase above 20ºC, the storage time between charges is cut in half. Therefore, at 28ºC the maximum storage time is 4.5 months. At 25ºC the maximum storage time would be 5 to 6 months. Need some extra advice on how to safely store VRLA Batteries? Just ask us!